The good thing about the short categories is that they make it very easy for voters to see all the nominees. Thanks to YouTube, I managed to see four of the five nominees for Best Animated Short. But the thing about animated shorts in particular is that, unlike their feature-length counterparts, animated shorts don’t need to make any sense whatsoever, as long as they tell a unique and inspiring tale. Whenever possible, I will include links to the short online. Our first nominee is Adam & Dog, which tells the story of how the first man on earth met mans best friend. Oddly enough, I find that the most interesting thing about this short is the animation. The backgrounds look very colorful and distinct, while the character movements is pretty stiff. I suppose the story is okay, but I found that it didn’t do much for me. Now, I love Fresh Guacamole! The dip. The short however is far, far too short to be an oscar winner. It’s basically just a quick little stop-motion that only exists to show off itself. Now, I have seen far better in that category. It’s nice to watch, but I don’t think it’s going to be an Oscar winner any time soon. My personal favorite to win is Head Over Heels, which tells the story of an old man trying to reconnect with his wife. Sounds dull? What if I told you that the wife lived on the ceiling? The reason that I fell in love with this short is not only the heartwarming relationship between the man and the wife, but also for the design of the house in which they live. It’s an incredibly detailed set that’s built to scale, and you can learn more about it here. This is the perfect example of how to make a short film. It doesn’t make any sense, but you know what? I don’t care! The only nominee I couldn’t find online is Maggie Simpson In The Longest Daycare. Seeing as how The Simpsons is a topic that a lot of voters hold dear, I think that this is the category’s runner’s up. I guess it looks funny, but seeing as how I have no way of finding it, I can never know for sure. 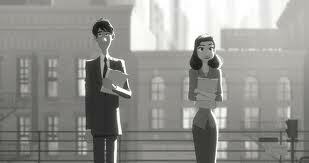 And then you’ve got Paperman, which I think is the likely winner. Like in Head Over Heels, the film tells the story of a charming romance with a supernatural twist. But not only is this film more popular, playing in front of the theatrical release of Wreck-It Ralph, but it also features CGI animation that’s designed to look hand-drawn and a beautiful score. Although it’s not my personal fave, this story has captured the heart of Academy voters, and I expect it to take home the gold.